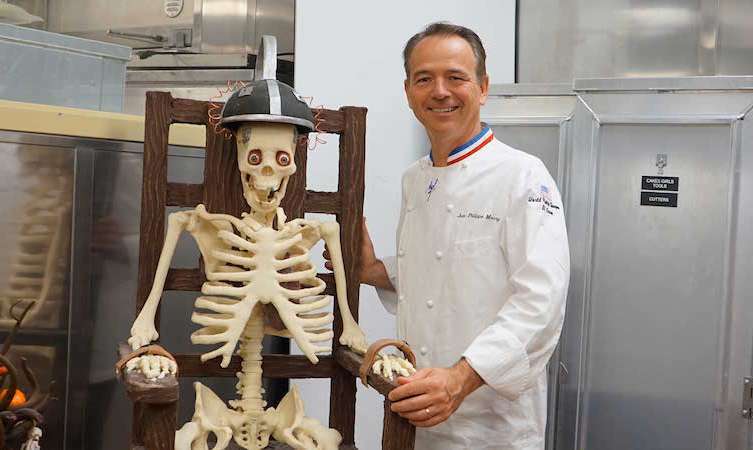 Zombies take over Jean Philippe Pâtisserie, the bakery and chocolate shop from Jean Philippe Maury at the Bellagio and Aria. Bot locations now feature Halloween-themed displays with gory and gruesome body parts as well as whimsical cakes and pastries. 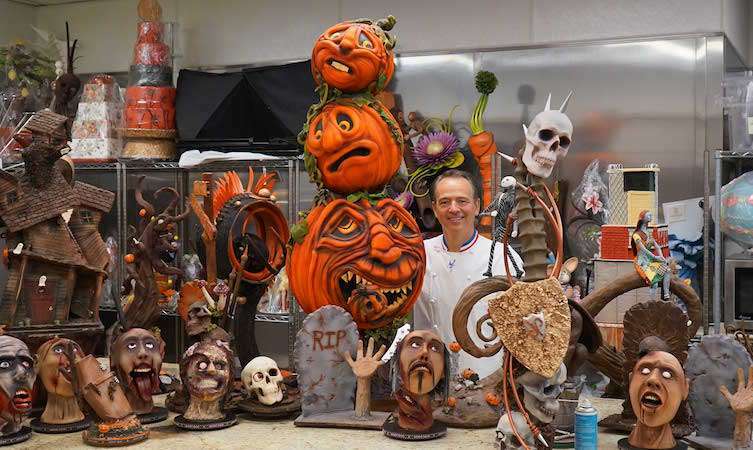 Executive pastry chef Claude Escamilla and his team worked for eight months to create more than 45 festive showpieces that place the undead at center stage. With a year of planning, countless sketches and hundreds of ideas from skilled pastry artists, the final display showcases their hard work through a cake closely resembling human flesh, tombstones straight out of a horror movie and many more hair-raising pieces. At the Bellagio, a zombie showgirl takes center stage standing next to a rundown “Welcome to Las Vegas Sign” and in a mountain of rubble made from cookie and sugar pieces. She was created using nearly160 pounds of chocolate and 75 pounds of rolling fondant. Scary zombie heads, wicked jack-o’-lanterns and other intricate, holiday-inspired delights decorate every nook and corner in both European pastry shops, each creating complete Halloween scenes. Guests also can take home delicious Halloween treats, such as spider cupcakes and chocolate ghosts, available for purchase in-store at the Bellagio and Aria locations and online at www.jpchocolates.com. Jean Philippe Pâtisserie also offers an assortment of French favorites including crêpes, pastries, chocolates and gelatos in addition to a wide variety of retail selections and custom cakes. 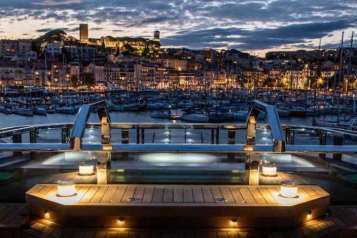 Ready to buy a Yacht? Look at Five with Fabulous Interiors!